Palermo is an expansive neighborhood that covers a lot of territory in Buenos Aires. It's been unofficially subdivided into mini-barrios within, each with its own personality. Palermo Soho, named after the trendy New York neighborhood, is filled with sidewalk cafes, bars, boutique shopping and street art. 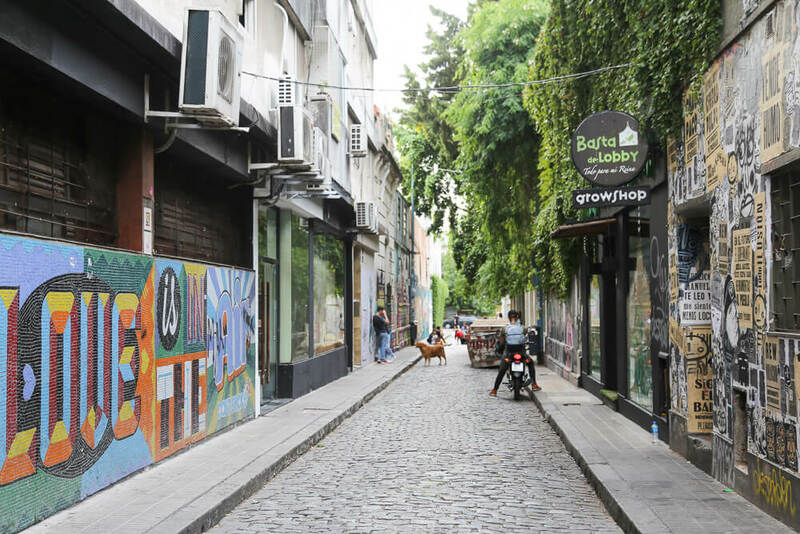 You'll hear a lot of English here, the barrio is a magnet for expats and backpackers alike. But never fear, Palermo Soho is just as popular with young locals as it's home to the best nightlife in the city and the trendiest restaurants. Try to visit in the afternoon and in the evening, for two different experiences. In the afternoon you can take a lazy stroll down the cobblestone streets under the canopies of trees, sip on a coffee in a sidewalk cafe and shop in trendy boutiques. In the evening enjoy cocktails and a nice dinner. There are two main squares in Palermo Soho: Plaza Armenia and Plaza Serrano. The streets branching off these squares are filled with tempting cafes and shops, use them as a base to jump off from. Plaza Armenia is lined with restaurants and has a playground if you have children. Plaza Serrano is lined with bars and is perfect to grab a liter of cerveza to enjoy outside if the weather is nice. Both plazas have sidewalk markets on the weekends with crafts and tchotchkes. DON JULIO | Out of the two most popular parillas in Palermo Soho, I prefer Don Julio, at Guatemala 4699. The service is incredible, the dining rooms are gorgeous, they have a great wine list and not to mention the quality of the meat. I LOVE it here. To avoid a long wait make a reservation, you can do so on their website. LA CABRERA | The other most popular parilla, you've most likely heard of La Cabrera (located on the corner of Thames and Cabrera streets). You can make a reservation on their website, do it to avoid a long wait. If you're on a budget, take advantage of their happy hour. Eat an early bird dinner between 6:30-8pm and get 40% off (a great option for Americans who aren't used to the late dining hours yet). No reservation required for happy hour. EL PREFERIDO DE PALERMO | Y'all, t his bodegon style restaurant is to. die. for. It's located in an old general store, and still displays cans of fruit, jars of pickled vegetables and oils along the walls to give you that old store vibe. Their milanesas are fantastic and large enough to share, they have great tortilla española and rabas (calamari). CHORI | A newer addition compared to the previous three which are classics, Chori is the spot to go to for a choripan (chorizo sandwich. They have elevated the street food into something of quality. Order your choripan of choice with a cocktail and enjoy! BURGER JOINT | One of the best burgers in the city, Burger Joint has that dive bar vibe just a couple blocks from Plaza Serrano. Order La Mexicana for a spicy Guacamole covered burger and thank me later. COSI MI PIACI | Craving Italian pizza after the thick crust, cheese-heavy Argentine version? Cosi Mi Piaci, near Plaza Armenia, will have you feeling like you're in Naples. NOLA | Not technically in Palermo Soho, but since it's only a block or two outside, and it's so damn good, I had to include NOLA. Opened by expat chef Liza Puglia in 2012, they serve up the best fried chicken you'll find in Buenos Aires, along with fried sweetbread, gumbo, and beer on tap. PAIN Et VIN | I've loved coming to Pain et Vin for years now. Peruse the wine menu, which is composed of a wall-sized shelf of bottles to choose from. Ask sommelier and owner, Eleanora, for a recommendation or arrange a private tasting. Order a cheese plate with house-made bread baked by her husband Ohad, the pain to her vin. FACON ! This cute home has been redesigned into the best place for both shopping and tasting the best local wines. The shop is stocked with the best Argentina has to offer. From furniture made from cactus from Catamarca to woven baskets and wool Llama blankets from Jujuy. If it's stunning and made in Argentina, you can buy it here. Relax on the outdoor patio to order from their wine list featuring small boutique wineries and charcuterie plates. REY DE COPAS | Look no further than Rey de Copas for the best cocktails in the coolest setting. Decorated eclectically with masks from around the world, low tables surrounded by sofas and pillows, you can easily feel like you're actually in Marrakesh. SORIA | Great cocktails and an even greater space, this bar is quite large. With rooms, an outdoor space and a terrace to choose from. A great place to come for drinks before going dancing, or to come early and enjoy a drink with dinner from their kitchen. I'm not a big coffee drinker, so I'm recommending these spots on reputation alone. I mean, I'm riding my bike to Palermo, there better be a Malbec in it for me, not a coffee. Sorry, not sorry. FULL CITY COFFEE HOUSE | I hear good things about this little hole in the wall, try it out and report back! I hope it solves your caffeine cravings. PADRE COFFEE ROASTERS & BEER | I've walked by this corner of Borgers & Soler streets and every time I think, this place looks gorgeous and tempting. Their coffee menu is huge with beans from all over the world. I really enjoy it here and if you're looking for a place to get some work done, this is a great place to come with your laptop and work remotely. LIBROS DEL PASAJE | This place is too great. Libros del Pasaje is a bookstore that will have you losing track of time while you peruse all of the books on display. In the back of the shop is a cafe with sofas and good wifi if you need to get some work done. Palermo Soho is filled with small boutiques (like the drool-worthy leather above) as well as local brands. The streets between Plazas Armenia and Soho are filled with shops to explore. If you prefer handmade items, Plaza Serrano is lined with large spaces filled with booths stocked by individual designers. You're sure to find something unique here. You can forget the chain hotels if you want to stay in Palermo Soho. Airbnb is your best option here. You can get cute, fashionable apartments from $40 a night. If it's summer pick an apartment or house with a pool and a terrace to enjoy the hot nights. There aren't a lot of buses that cut through Soho, you can take the 34 or the 39. But your best option is to take the Subte D line to the Scalabrini Ortiz or Plaza Italia stops and walk up from there. Everywhere I mentioned above, pinned conveniently on a Google Map. Color-coded: bars/wine in purple, coffee in yellow, restaurants in green, the plazas in blue. Enjoy!